During the last two episodes we have tracked the creation and events of the Arab Revolt in the Hejaz, in modern day Saudi Arabia. Today we will pull away from that story to catch up with events in two other areas of the Ottoman Empire. We will begin far from the hot deserts of Arabia with discussions about the fighting in the Caucasus Mountains. Here the Ottomans would first be pushed back by the Russians, only to then turn around and throw the Russians back after the revolutions of 1917. The second half of this episode will look at the British campaigns in Mesopotamia. Here the British would have to recover from the disaster at Kut al-Amara before once again lanching their campaign to capture Baghdad. We will then end this episode with a brief discussion about Disease during the Mesopotamian campaign. Fighting in the desert posed different challenges to the armies when compared to the European fronts, so I thought it would be interesting to see how the British leaders dealt with the specific issues encountered in their campaigns in the deserts of Mesopotamia. When the Ottomans had entered the war they had attacked in the Caucasus mountains in modern day northeast Turkey and the countries of Georgia, Armenia, and Azerbaijan. At the time much of this area was divided between the Russian and Ottoman empires. This initial Ottoman attack had been largely a failure with many men lost, some of them freezing to death in the mountains, and not much to show for the effort. After this defeat the front died down for some time as the two nations dealt with troubles elsewhere. However in late 1915 the Russians began to consider an attack in the region. The catalyst for this attack was partially Gallipoli. With the impending evacuation of the Gallipoli peninsula the Ottomans would be able to bring reinforcements to the east, which meant that if the Russians were going to attack they needed to do it soon. The Russian leader, General Yudenich hoped to launch his attack before any of these troops arrived, which he believed would take about 3 months. The goal of the attack was to move toward the city of Koprukoy which would hopefully cut off the Ottoman third army. In an interesting twist Yudenich disguised the preparations for the attack as the Russians bringing up Christmas supplies and food for the men. Instead of preparing for a Christmas feast the items being brought to the front were supplies for the coming attack, which would be launched on July 10th. When the attack began the Ottomans were taken completely by surprise. In fact, the commander of the Ottoman Third Army was not event at the front when the attack began, he was instead in Istanbul meeting with Ottoman leadership. The Russians first attacked the Ottoman left wing, with the intent of pulling reinforcements in that direction, which they were completely successful at. The Ottomans would shift two divisions to meet this attack. Then the Russians attacked on the right, against trying to pull reserves in that direction, and again they were successful. The Ottoman commander would move his last reserves to the right. These two actions were only a setup though, and now the largest Russian attack fell upon the main Ottoman positions in the center. Here the Russians massed most of their artillery and half of their infantry. In just a few hours the Ottoman positions were in Russian hands, and the advance was just beginning. The attack developed so quickly that the entire Ottoman front began to fall apart, far faster than the Russians had anticipated. The Turkish troops were mostly able to escape, making the attempt to cut them off the only Russian failure of the operation. The Ottomans would suffer about 22,000 casualties, more than double the Russian number of 10,000. One of the more impressive pieces of success was that during this attack the Russian attackers did not greatly outnumber the Ottoman defenders, with there being only 80,000 Russians to attack 74,000 Ottomans. Due to this success Yudenich was able to request more troops from the Russian strategic reserve, and these troops allowed him to continue his attack. The Ottomans would continue their retreat far past Koprukoy, not stopping until they reached the fortified city of Erzurum, where they planned to mount a defense. Erzurum was a reasonably strong position for the Ottomans to fall back into. It has been designed as an anchor for the Ottoman frontier, to protect specifically against a Russian attack. This design and construction had been overseen by German advisors, and they had construsted a series of defenses that included over 200 artillery pieces. These defenses also used the mountains around the city to help provide even better artillery positions. There were two rings of defenses an inner ring and an outer ring, both of which the Russians would have to work through. While many of these defenses were strong, at least on paper, there were still some problems that they would face, much of it related to how old some of the defenses were by 1916. The biggest problem was that while there were many artillery pieces in the fortifications, none of them were very large, with none larger than 150mm and most being less than 85mm. This put a limit on how far these guns could engage the enemy, and many Russian guns would be able to stay completely out of range of the defenses while still raining fire down upon them. There was also some issues with the defenders, namely there simply were not enough of them. Erzurum was a large and complex network of defenses, and the 40,000 Ottomans who retreated into the city were simply not enough bodies to man the entire network. This left large gaps in the defenses, which the Russians would prove fully capable of identifying and exploiting. The Russian assault would begin on February 11th, in the middle of the afternoon. 250 guns would open fire against two of the strongest Ottoman positions. While these positions saw the majority of the Russian fire, they were not the primary targets for the attack, they were simply a feint. In a plan that mimicked earlier succeses, the goal of these attacks was to pull in Ottoman reinforcements before the primary Russian attack was launched elsewhere. When the main Russian attack did begin it would be targetted against the center-right area of the Ottoman defenses, and the defenders would be unable to stop them. Durign this attack the Russians were able to capture a very detailed map of the entire defensive system around the city. Apparently this map was on the body of an Ottoman officer. Once this information was obtained it was only a matter of time. Other positions began to fall and once this began the Ottomans would be unable to stop it, it was just like dominoes. After just 4 days of fighting the evacuation of the city had already begun. After 5 days the Russians were in the city. The defense of Erzurum had cost the Ottomans another 20,000 men, which basically destroyed the Third Army as an effective fighting force. The Russians had lost just 9,000 men. The retreat from Erzurum would be just the beginning of the Ottoman retreat, and it would continue for 200 kilometers. This would cause serious problems for the Ottomans as Sean McMeekin would describe in his book The Ottoman Endgame. "Once the crown jewel of the Ottoman Third Army, Erzurum was not a secure Russian forward base, from which Yudenich could launch probes and assaults toward the heart of Anatolia." After this massive advance, the Russian army would begin to slow. They were now hundreds of kilometers from where they started, and supply lines began to be a serious problem. After the advance stopped the rest of 1916 would see the Russians capitalizing on their advance to take other cities in the region, however in late 1916 all of these efforts stopped. By this point there were over half a million Russian troops on the Ottoman front, and there were many morale issues just like on other fronts during the war. Discipline was not fantastic, there were a good number of deserters, and while the army did not completely disintegrate or anything, offensive operations were off the table. With the events of 1917 happening in Russia the Ottomans, at least initially, just sort of let it happen. They saw that the Russian army was not in a good state, and so they just let it continue to deteriorate. This Ottoman inaction could not last forever, and there were many Ottoman leaders who wanted to launch an attack especially Enver Pasha, one of the Young Turk leaders. 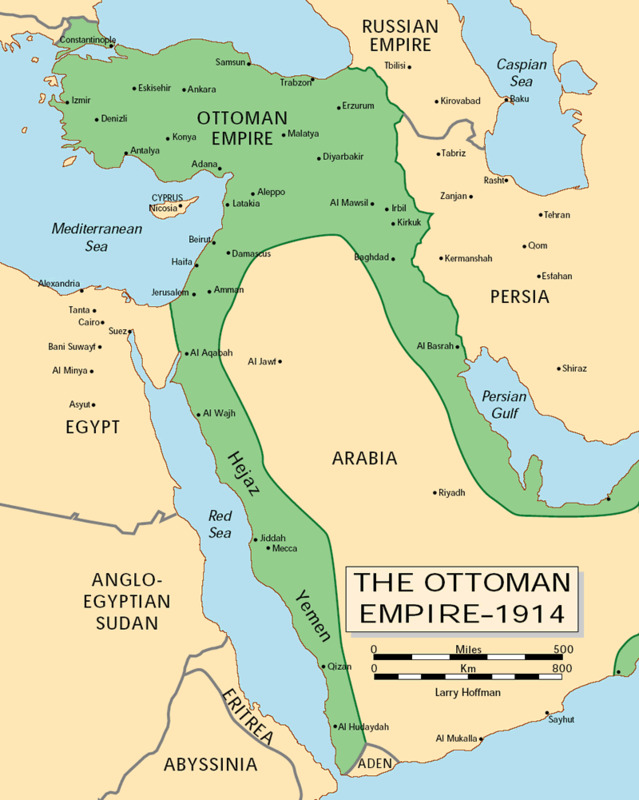 The goal of these attack was to push the borders of the Ottoman empire eastwards, even as attacks in other parts of the Empire were causing it to collapse. To this end 9 new Turkish divisions would be sent to the Caucuses front at a time when these troops were desperately needed elsewhere, like in Palestine. Before Enver attacked there would be something of a break between Germany and the Empire. Throughout late 1917 there had been growing tension between the two countries as the Germans were working closely with the Bolsheviks to try and conclude an armistice and then the Russian exit from the war. This close relationship angered the Young Turks with Talaat sending a message to Berlin saying that if Germany was making arrangements with Russia, then the Ottomans might have to go their own way in the war. With relations already at a breaking point with Germany, Enver believed it was time to attack the Russians. He planned to attack into Armenia and Georgia, and if things went well to continue the attack into Azerbaijan and Turkestan. For this purpose a new army was created, called the Army of Islam, and all Europeans were removed from its units. This army was then sent off on the attack, with the Russians putting up little resistance. There was resistance from the Armenians, but this did not prevent the army from eventually reaching the city of Baku on the coast of the Caspian sea. Baku was already the oil capital of this part of the world, and it was the goal of many governments during the war to hold sway over it in the future. The Russians wanted to keep it, the Ottomans wanted to capture it, the British wanted it to be independent, and the Germans did not care as long as they got the oil. In the summer of 1918 a new governmentw as created in Baku which called upon the British for support. For their part the British were concerned with larger problems, like the possible movement of Ottoman troops into Persia, Afghanistan, and India. These concerns were legitimate, with Ever seeing them as long term goals, but most importantly for Baku it caused the British to take much more interest than they otherwise would have in defending the city. to this end the British sent a force of around 1,100 officer and men to Baku. While these new troops were welcome, when the Ottomans arrived with between 15,000 men they began their assault on the city. There were several thousand defenders, but many were not much more than local militia, heavily outclassed by the Ottoman attackers. Just a few weeks after the attack began the city would fall. While the Ottomans were achieving this victory, it would not matter in the end, because on every other front their defenses were falling apart. The British campaigns in Mesopotamia during the war can be broken into two different phases, what happened before Kut al-Amara and what happened after. The surrender, which occurred in April 1916, combined with the retreat in Gallipoli just a few months before, woudl send shockwaves through the British military. These two great failures, which occurred against an enemy that was considered to be an easy target, would cause the British to have a long hard look at what had went wrong. To try and understand the failures a Commission of Inquiry was setup in London and that Commission would gather evidence and interview individuals throughout the last half of 1916 and early 1917. The final report ont he Mesopotamia Campaign leading up to Kut al-Amara would not be released until May 1917. Much of the blame for the failure was placed on the Indian administrators who had organized the campaign and their general lack of consideration for logistical matters. This caused such a scandal that the Secretary of State for India resigned and General Duff, the highest ranking military officer in India, would later commit suicide. While the failure was still being discussed in London, in Mesopotamia the war continued. The biggest immediate change was the change in command for the troops in the area. Instead of being under the control of India it was brought in as part of the Mediterranean Expeditionary Force, effectively putting it under direct control from London. This would be the first step in getting the units reorganized and re-equipped for the next effort. The second big change was the arrival of new commanders. General Monro was the commander of the Mediterranean Expitionary Force and had commaded it at Gallipoli. General Maude would be in command of the troops in Mesoptamia. Both of these generals were very experienced and they understood the importance of proper logistics, something that had never been at the top of the list in the first two years of the war. When they were brought in they would completely overhall the administrative side of the campaign, and begin a series of changes that would put the troops in Mesopotamia in a much better position to achieve their goals. the first of these changes was a huge effort to make the port of Basra far larger and able to sustain a larger number of troops in the field. This was done of the course of the summer and autumn of 1916 and through this work the port facilities were massively expanded. When the improvements were complete the port could process three times the amount of suppplies. Since this was the single port used to supply the entirety of the Mesopotamian Expeditionary Force this greater capactiy was critical to future success. The second big change was a much greater emphasis on expanding the rail networks out of Basra to reach as far into the interior as possible. The further these rail lines reached the easier it would be to supply the most advanced troops. Finally, Maude set out to establish a series of supply depots along the Tigris, and then to stock them to allow for a greater margin of error when it came to transporting supplies of the river which up to this point in the war had proven to be anything but reliable. All of these efforts that went into the logistical infrastructure of the army would allow more men, machines, and material to be moved from the Persian Gulf to the point of attack. While the British were improving their situation the Ottoman situation was deteriorating. There was a draw down of Ottoman strength in the Mesopotamian theatre as heavy losses continued on other fronts and troops had to be moved to meet other threats. This would make them vulnerable when the advance towards Baghdad resumed in the middle of December 1916. By this point many of the improvements to the supply lines were complete and Maude launched an attack to get the British across the Hai river. Shortly after getting across they were hit with heavy rains, which delayed further attacks. This would pause the offensive until January 19th when they captured the town of Hai. Once the attack started up again the advance began to speed up. Sannaiyaat was captured on February 23, the Tigris was crossed on February 25th and Kut al-Amara was recaptured the same day. Once Kut was reached the British purposefully halted for two weeks while supplies were brought forward and stored in preparation for futher advances. On March 4th the final push for Baghdad began. It was take just 6 days for the British to march on and take Baghdad, with the Ottoman defenders having abandoned the city the day before. The British, upon arriving in the city, would have to restore order since after the retreat of the Ottoman troops a large amount of looting and rioting had broken out around the city. With Baghdad captured the primary objective of the campaign was complete. The British attacks would continue with Baquba, Falluja, and Samarra all captured by the end of March. Later in 1917 they would then go on to capture Ramadi, Kifl, and Tikrit. In all of these cased the goal was to prevent any kind of Ottoman counter-attack against Baghdad, although these fears were mostly unfounded because the Ottomans were never able to prepare for such an effort. Once these final objectives were captured the campaign would pause for several months during late 1917 until the early months of 1918. At this point the British would begin to once again advance, however they were no longer motivated by the need to put the Ottomans out of the war but were instead far more concerned with the Russian situation. With the removal of Russia from the war in early 1918 there was concern that Ottoman and German troops would advance into Persia, and maybe even India. this prompted the British to advance north from Baghdad, capturing Mosul on November 10th, 1918. While this was a day before the armistice on the Western Front came into effect it was 11 days after the Ottomans had signed an armistice. It would be at that point that the war in Mesopotamia was over. As many long-time listeners know, there are times when I read a really interesting, specific, and often obscure journal article that ends up making me want to talk about something on the show, and this exactly what has happened with the topic that we will use to close out the episode. In this case our information comes from the anthology Facing Armageddon which contains a chapter written by Mark Harrison entitled The Fights Against Disease in the Mesopotamia Campaign. The chapter discussed a pretty niche topic, the way that the British dealth with diseases, and specfically deficiency diseases, in the Mesopotamian theater. For the troops in the Middle East the most damaging of these diseases would be scurvy. Before the war the cause of diseases like scurvy was not know, there were many theories, with Dr. Casimir Funk suggesting that they were caused by a vitamin deficiency. While Funk had hit on the right answer this theory was not accpeted by everyone, or even most doctors. Many doctors still believed that scurvy was caused by a bacteria or something in the food being eaten instead of the lack of something, namely vitamin C.
The concerns about deficiency diseases began right at the start of the campaign. In the initial advance out of Basra there were serious concerns about the rations that were given to the Indian soldiers. The Assistant Director of Medical Services in Mesopotamia, Colonel Hehir, would write a report where he stated that "the present field service diet of Indian troops and followers has certain intrinsic defects and it is suggested that the whole question should be reconsidered." His primary concern was the lack of meat and vegetables given to the soldiers. This was an issue caused by how the Indian army was constructed before the war, and how that carried over after 1914. Indian troops were traditionally given an extra allowance of money from which they were expected to supplement their rations with food from local merchants. This worked great in more populated areas, and it let the troops setup their rations to their own liking while also reducing the logistical pressures ont he army. However, there were simply not enough civilian merchants in the areas that the troops were being asked to march through on their way up the Tigris and Euphrates and his meant that the troops only had what was given to them. These rations were heavy in cereals and low on difficult to transport items like meat and vegetables. These dietary problems would result in a high rate of scurvy and other diseases among the soldiers. This would cause a Medical Officer, a Colonel Willcox, to urge his commanders that "the necessity of taking immediate measures to improve the ration of the troops at the front on the lines indicated. The defects in the dietary of the troops are at present GREAT and demand urgent attention." IN early 1916 the number of men disabled due to scurvy would continue to increase. Willcox would estimate that this one disease was responsible for between a fifth and a third of all of the sickness experienced by the troops. With the wastage that scurvy and other diseases were causing the Indian leaders were forced into action and in July 1916 rations were improved to include 2 ounces of fresh fruit and 4 ounces of fresh vegetables every day. This increase was welcome, but was still not enough. In October 1916 rations were increased again to include 6 ounces of meat, 6 of vegetables, and 2 ounces of fruit. While this was approaching an appropriate amount for the troops, it also put serious strain on the already overstretched supply lines. A partial solution began to be experimented with in August 1916, and it came in the form of lime juice. Lime juice was found to help with scurvy, which makes sense given it is vitamin C deficiency that causes it in the first place. This juice would be prepared in India, with the juice mixed with alcohol and salicylic acid so that it could be preserved on its long trip to the front. By 1917 250 gallons of lime juice were reaching the front every day. This lime juice would provide the troops with vitamin C and it would get the British to Baghdad. Once they captured the city things became much easier since they no longer had to transport all of their supplies up the Tigris and Euphrates and could instead take advantage of the infrastructure around Mesopotamias largest city to get more fresh food. The reason that I thought this story was interesting is best summarized by Mark Harrison, who would himself quote Willcox when he said "It should be remembered that the vitamin theory of deficiency disease was still in its infancy and the subject of some controversy in scientific circles. Willcox was later to claim that the Mesopotamian campaign had provided just the kind of practical demonstration that the theory required in order to gain acceptance outside of a small elite of medical scientists. ‘It is very doubtful’, he wrote in a report to the DMS, India, in 1919, ‘if any campaign has ever furnished such very important and interesting data on the very close bearing which rations have on the health of the soldier, and the great danger of Vitamin Deficiency in a ration has been demonstrated on a very large scale.'" When people discuss the innovations from the war some typical answers are tanks, airplanes, artillery tactics, but there were countless small things like a better way to treat scurvy. These small breakthroughs are often forgotten, but often had long lasting and important effects not just on the militaries of the world, but instead everyone. There were countless forgotten scientists, doctors, normal people solving small problems because they had to, and those solutions sometimes make all the difference. Thank you for listening, and I hope you will join me next episode as we continue oru discussion on the war in the Middle East as the British march out of Egypt for the first time.